A long-standing debate about the source of the asteroid that impacted the Earth and caused the extinction of the dinosaurs has been put to rest thanks to the Chelyabinsk meteorite that disintegrated over Russia in February 2013, a new paper published in the journal Icarus shows. Astronomers have debated whether the dinosaur killer was linked to the breakup of a large asteroid forming the Baptistina Asteroid Family (BAF) beyond Mars, some of which ended up on Earth-crossing orbits. The asteroid impacting Earth is thought to have been dark and carbonaceous. The BAF hypothesis was bolstered by them being dark and with a spectral shape similar to carbonaceous meteorites. 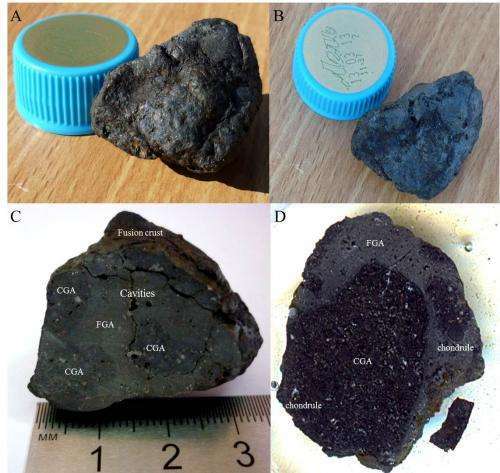 Analysis of the Chelyabinsk meteorite shows that shock produced during catastrophic disruption of a large asteroid can darken otherwise bright silicate material. Shock darkening was first reported by Dan Britt (now at the University of Central Florida) in the early 1990s. The Chelyabinsk meteorite has both bright unshocked and dark shocked material. However, the details of the spectra of the dark Chelyabinsk material closely reproduces spectral signatures seen with members of the Baptistina Asteroid Family, said Planetary Science Institute Research Scientist Vishnu Reddy, lead author of "Chelyabinsk meteorite explains unusual spectral properties of Baptistina Asteroid Family" that appears in Icarus. "Shock and impact melt can make bright asteroids dark," Reddy said. "In other words, not all dark asteroids are rich in carbon as once thought." The latest measurements rule out the possibility for the Baptistina family being the source of the K/T impactor, he added. "The link between the K/T impacator, thought to be carbonaceous, and BAF, has been proved invalid," Reddy said. Chelyabinsk provided a great opportunity to see the mixture of shocked and unshocked material in a single meteorite, Reddy said while cautioning that no clear evidence exists that the Russian meteorite itself came from the Baptistina family. "The new finding has implications for hazards from Near-Earth Objects and for mining asteroids for space-based resources," Reddy said. "A potential target identified as primitive and rich in volatiles/organics and carbon based on its spectral colors could in fact be just shocked material with entirely different composition." PSI researchers David P. O'Brien and Lucille Le Corre were among the co-authors on the paper.